Today I am featuring the artist Kate Kretz! We have corresponded a little by email, so I have a mini-interview plus photos of her work. My writing is in italics, the rest is Ms. Kretz. My degrees are in painting, so, as far as embroidery goes, I have been teaching myself/making things up as I go along. The lack of training is incredibly liberating: if you don’t know “the rules”, it allows you to create without limitations. Right now I am working on a 3D hair embroidery, and I spent 20 hours on it before I started to feel that it just might work and not fall apart. Pushing those boundaries keeps the work exciting for me. 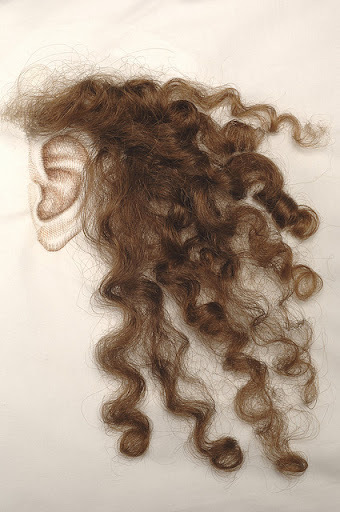 One of my works, “My Young Lover”, has hair that actually appears to “grow” out of the pillow: each strand has a drop of archival glue on the end of it to act as a “stop”, and I invented a tool to thread each strand through the pillowcase. One of my boyfriends once brought me his beautiful golden ringlets in a shoe box, saying “I think you love my hair more than you love me.” I kept the curls in a cut glass box for several years, and decided to get them out of the house and make art with them when I eventually got married. Most of the hair is mine, procured by running my hand through my hair after washing. 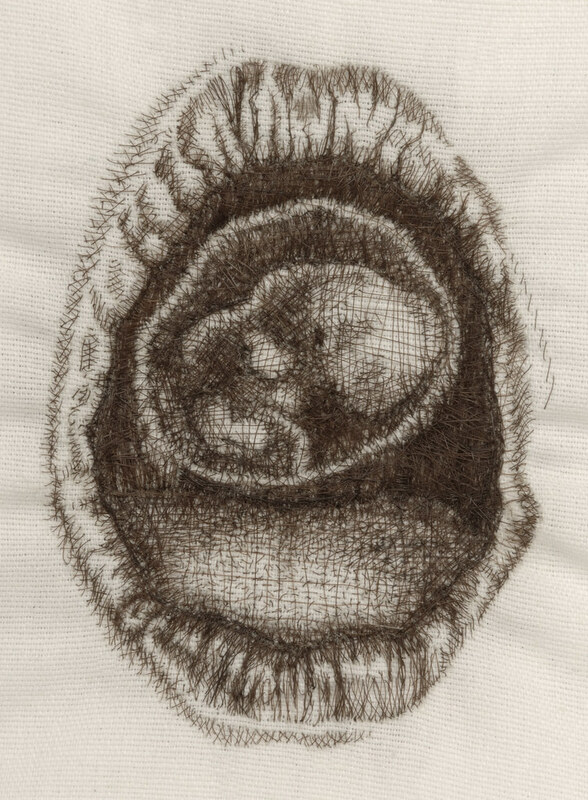 I have done an embroidery (and I am currently working on a companion piece) using the hair that was on my head when I was carrying my daughter. 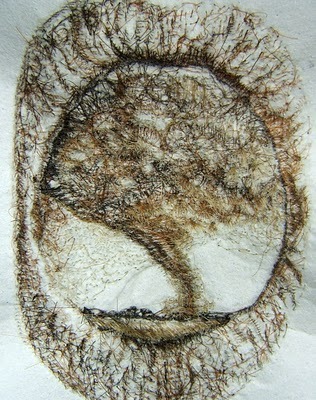 Hair is like the rings of a tree: it records extreme life experiences, and holds so much meaning. 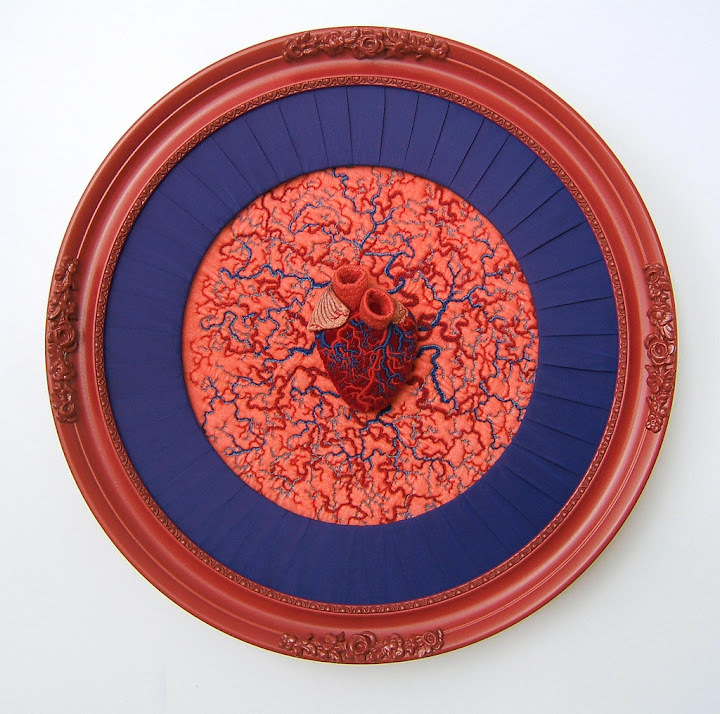 “Heart Center” features a three-dimensional heart that I envisioned, and then tried to realize by making up techniques to create the forms. Lately, it seems as though nothing is worth working on unless there is uncertainty about whether I can pull it off. 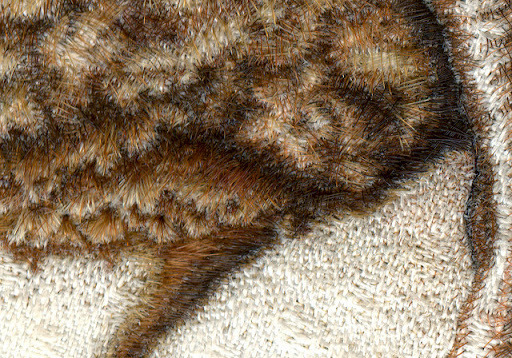 I continue to paint, but I am continuously seduced by the sensual, tactile quality of fiber: I feel that it feeds an important, almost primal, need as our world becomes increasingly virtual. I maintain a studio blog (note from Hannah: occasionally NSFW – international readers that means some of the art is racy), and anyone who is interested in how these pieces were made step-by-step can look through the archives: it’s an open book. Here is a month where I have just begun the heart piece, and I am a quarter of the way through a hair embroidery. 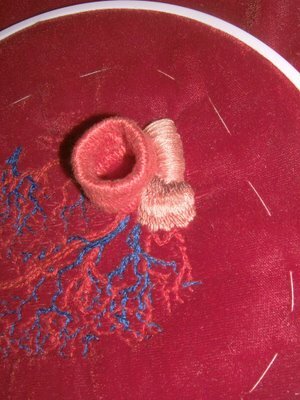 Also from the blog, this view of the back of one of the hair embroidery tornadoes, and an in-progress view of the heart. If you want more photos of completed work (very cool! 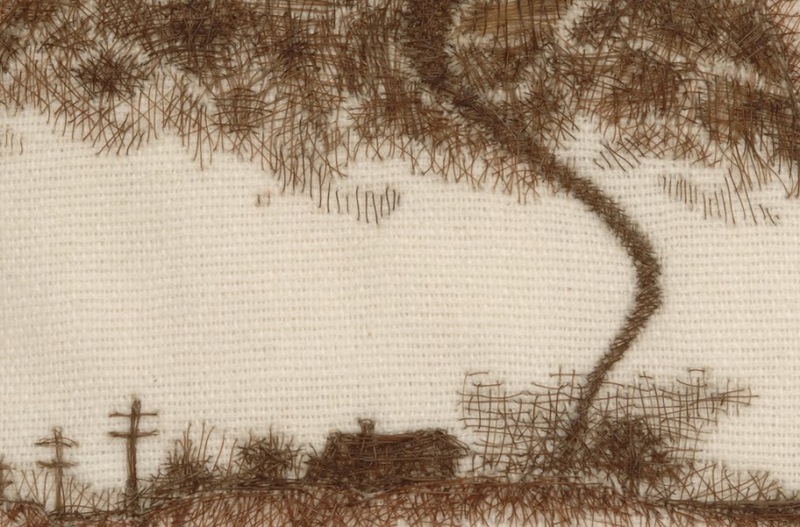 ), see her fiber-based work flickr set and her general flickr set. 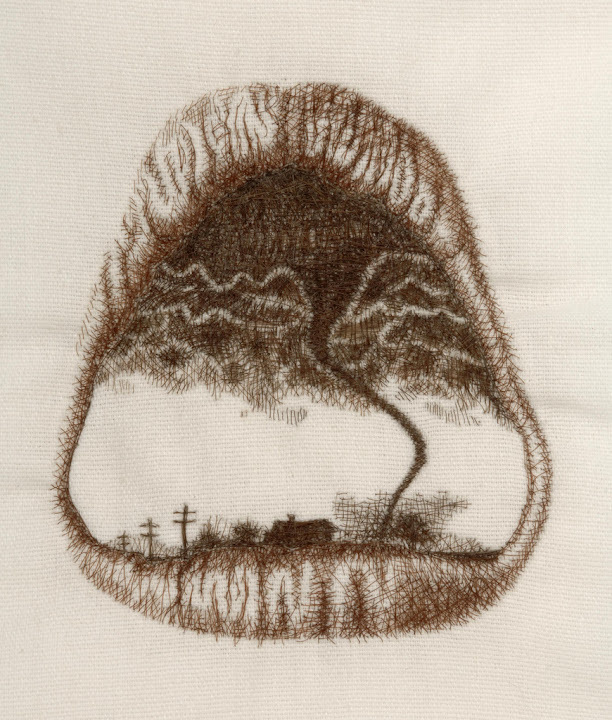 If you want to read another interview with Kate Kretz, there is an interesting one at Mr. X Stitch, covering a different set of questions. This entry was posted in Uncategorized and tagged 3D embroidery, artists, embroidery, hair embroidery, kate kretz. Bookmark the permalink. The hair does sound like a pain.